Have you ever felt hurt by what someone else has said and you didn’t know how to tell them without causing even more distance and anger? If you answered “yes” to any of the above questions, you’re certainly not alone. We’ve all said things in ways we’ve regretted. What came out of our mouths just seemed to slip out by its own accord. And, we’ve all been hurt by what someone else has said or how they’ve said it–and we’ve either regretted our response or we felt powerless to do anything about what was said. Again, if you’ve felt this way, you aren’t alone. All you have to do to understand why so many relationships and marriages end in separation or divorce is to listen to the words people use when they communicate with each other. Their communication is filled with put-downs, assumptions, accusations, and defensiveness–which escalate as each person adds to it. There’s usually no clear way out of it. 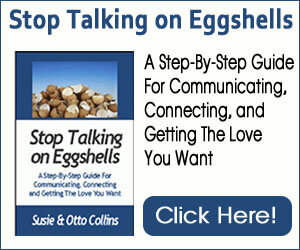 We’ve done all these things we just mentioned too at some point in our relationship and life and let us tell you, there are some definite strategies for saying the “right thing” when communicating with someone close to you. If you’ve had problems with communication with a certain person, we’re going to take a wild stab at your mindset about that person? While you may feel you are completely justified in your mind to keep these attitudes going–and you may feel a sense of satisfaction in a weird sort of way keeping them, nothing will change if you hold your focus in that direction. If you really want to change your communication so that there’s more ease, love and connection, you’ll want to adopt a “Magic Words” mindset. Here’s what a “Magic words” mindset is? Get yourself in this mindset by breathing, moving your attention inside you to your heart area instead of listening to your chattering mind. Let go of trying to control the other person–because ultimately, you really can’t. “Magic words” are not about control. They are about opening to each other so that you can understand one another. So often, the words you use do not necessarily cause the separation but it’s the way you say them. It’s your tone of voice which can be mocking, sarcastic or sharp that can push the other person away just as if the words themselves were the culprits. Even if you don’t think you were mocking, sarcastic or sharp, the other person may get that idea. Because your tone of voice usually doesn’t lie, your true feelings can seep through without you even being aware of it. The other person will be able to pick up from your tone of voice that you truly aren’t sorry–and that you have other words to say. So before you communicate about a touchy issue, get in touch with your true feelings and say them in a heart-felt way–without sarcasm. Sarcasm just masks what a person feels he or she can’t say to another. So drop the sarcasm and say how you’re feeling in a way that the other person can hear. Your tight jaw will give away your true feelings every time. It’s one of the many places in your body that is a signal for you to notice an attitude, belief or intention that you might need to look at. If you start to speak and you feel tightness in any part of your body, take a moment and remember to breathe and relax that part of your body before you finish. See if you can recognize what attitude, belief or intention wants your attention. It’s been said that more than 96% of communication is done non-verbally. If you just start to notice your interactions with others, you’ll know that’s true. When you pay attention to what’s happening in your body before you speak and take some measures to figure out why you closed, you’ll start to see a big difference in how you relate to others as you start to open to them. One way to learn how to communicate better involves looking at your attitudes, your beliefs, and your intentions by way of your body language–as well as the words you use. Become aware and conscious of your thoughts and your words and watch how your relationships get better!